At St Patrick’s College we are fortunate enough to have in our custody various types of memorabilia within our archive department. All memorabilia is identified, researched, catalogued and preserved for future use within the College Community. St Patrick’s also has a tailor made cabinet for displays of archival material located in the College vestibule. Here we are able to share some of our treasures with current students by presenting to them sections of our history in a more tangible way. 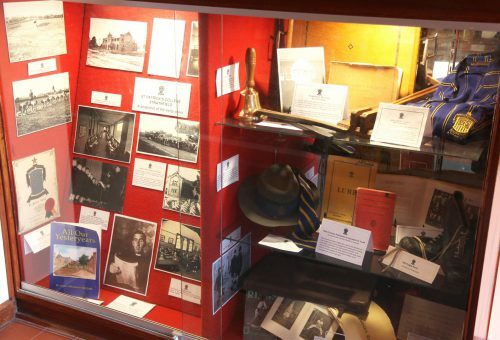 Some examples of interesting items which have been on display are Br Crichton’s trumpet, a striped sports blazer from the 1940’s, various old photographs from the schools inception in 1928, early copies of Lumen and other publications, an assortment of trophies and awards as well as the original old school bell. It is important to remember that the story of St Patrick’s is a continuing legacy of Edmund Rice and the Christian Brothers. For this reason we must preserve the College’s identity through the safe keeping of historical documents and precious memorabilia. This will ensure our Catholic heritage is maintained through future generations of St Patrick’s.